ขายยังไง /kăai yang-ngai?/ How do you sell this? กิโลละเท่าไหร่ /gì-lo lá tâ0-rài?/ How much is it per kilogram? กิโลละ 1,000 บาท /gì-lo lá nùeng pan bàat/ It is 1,000 Baht per kilogram. ตัวละเท่าไหร่ /dtua lá tâo-rài?/ How much is it per one? ตัวละ 500 บาท /dtua lá hâa rói bàat/ It is 500 Baht each. ลดได้มั้ย /lòt dâai-mái?/ Can you lower the price? เอากี่กิโล /ao gìi gì-lo/ How many kilograms would you like to take? เอา 2 กิโล /ao săwng gì-lo/ I would like to take two kilograms. Links to the videos you can learn more in details. Wow, Mod, this is a good one! 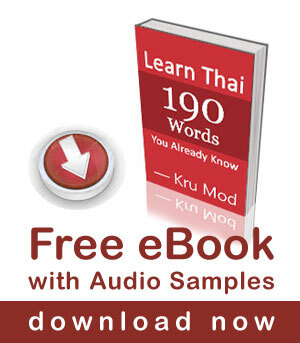 Sawatdee ka Joe, I am happy to hear that you found this lesson useful in your Thai learning. Thak you for your comment. Awesome, I like the way you teach Thai. Very fun and easy to learn. Thank you for your supporting comment. I am pleased to hear that. Sawatdee ka, thank you for your kind comment. Also we can note another abbreviation of กิโลกรัม “kilogram”, shorter than กิโล “kilo”. It is โล [lo:h(M)]. This word is also commonly used in real speech. เอากี่โล [ao(M) gee(L) lo:h(M)] = how many kilo’s do you want?